Featured. Santa Cruz and Cochabamba harvested five medals in South Korea; two gold and three bronze. Today they will return to the country. 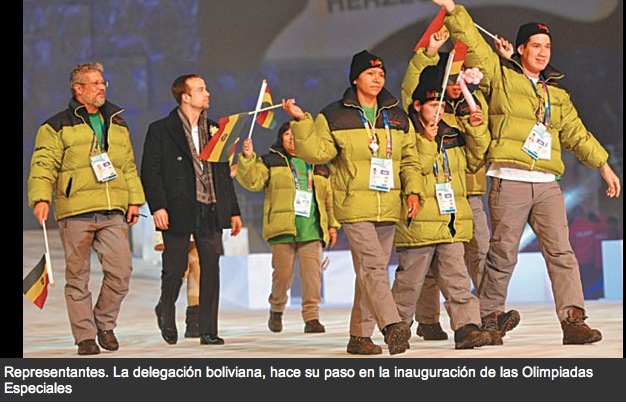 The Cochabambinos Carmen Rosa García and Edson Choque and from Santa Cruz Gerson Salas and Delicia Figueroa enrolled the name of Bolivia in the Special Winter Olympics, held from January 29 until the 5th of this month in the South Korean city of Pyeong Chang. The first three won medals. The highlight of the national delegation was Carmen Rosa García, who won two gold medals, in races from 100 to 400 meters, walking on snow. Another of the protagonists was Salas from Santa Cruz, who earned two bronze medals in the same disciplines as did the Cochabambina. Moreover, Choque, brought a bronze in 200 m and a sixth place in the 400 m also in tests of athletics, held in Asian thick snows. Although not able to get medals, Figueroa ranked fourth in 400 meters, making a good performance. The four national athletes, were accompanied by the coaches Antonio Jimeno and Miriam Huaygua, who also have great merit for the attainment of the medals. 110 Countries: Are those who participated in the Special Olympics, performed in Pyeong Chang (South Korea) 2013. Thank you Carmen Rosa García, Edson Choque, Gerson Salas and Delicia Figueroa for making us proud! I welcome you to The Hall of Bolivian Fame!